Teeth are held in the jaw by their roots. At the core of each tooth is a soft mass of tissue called the dental pulp. In a healthy tooth, the pulp contains living fibres, cells, nerves and a blood supply, extending into the root(s) through the root canal(s). Tooth decay or injury can destroy the living pulp. Dead pulp is more prone to infection, leading to an abscess and toothache. This can usually be dealt with successfully by root canal treatment (also known as root filling or endodontics). Sometimes infection can persist at the end of a tooth root, in the surrounding bone. In this case, a dentist can carry out an apicectomy. stitch the gum back in place. After treatment you will need to keep the area clean. For the first day, rinse with warm salt water several times a day, especially after meals. Use half a teaspoon of salt in a glass of warm water; not hotter than is comfortable. Brush the teeth normally, but be very careful not to disturb the cut. On the next day, continue rinsing and begin to gently brush the teeth next to the cut. There may be some bruising and swelling for two or three days afterwards. There will also be some slight discomfort - an ice-pack or a packet of frozen peas wrapped in a towel applied to the outside of the face can help. It usually takes about a week for an apicectomy to heal. 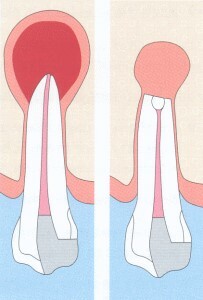 An apicectomy saves a tooth that would otherwise have to be taken out.